A few days ago I was contacted my Life is Art Creations and asked if I would like to receive one of their prints for a review? "Life is Art Creations specializes in alphabet photography as well as inspirational and custom alphabet photo prints, canvas prints and greeting cards." When it came to choosing the print I wanted, I was a little overwhelmed. I mean seriously, you have the entire alphabet to use. That's a lot of words to choose from. I was originally going to go with our last name but we have like a million things in our home with our name on it. Then I found this print. It was the perfect soon-to-be, newest addition to our home. I was so excited when I received the print in the mail. I immediately came home and started digging through my stash of frames. I found this frame at a yard sale a while back. I love how the rustic look of the frame matches the rustic wood in the photos. I may paint the frame in the future but for now I think I'll keep it like this. Don't you just love it?!!! Life is Art Creations is GIVING AWAY a $10 gift card for their shop to one of DIY Home Sweet Home's lucky readers. Visit Life is Art Creations and leave a comment telling me what print you would order if you won. Tweet about this giveaway and leave your tweet's URL in the comments. Leave a comment on DIY Home Sweet Home's facebook page letting me know that you entered this awesome giveaway, then leave me a comment hear telling me you did so. Giveaway will end Friday the 20th. 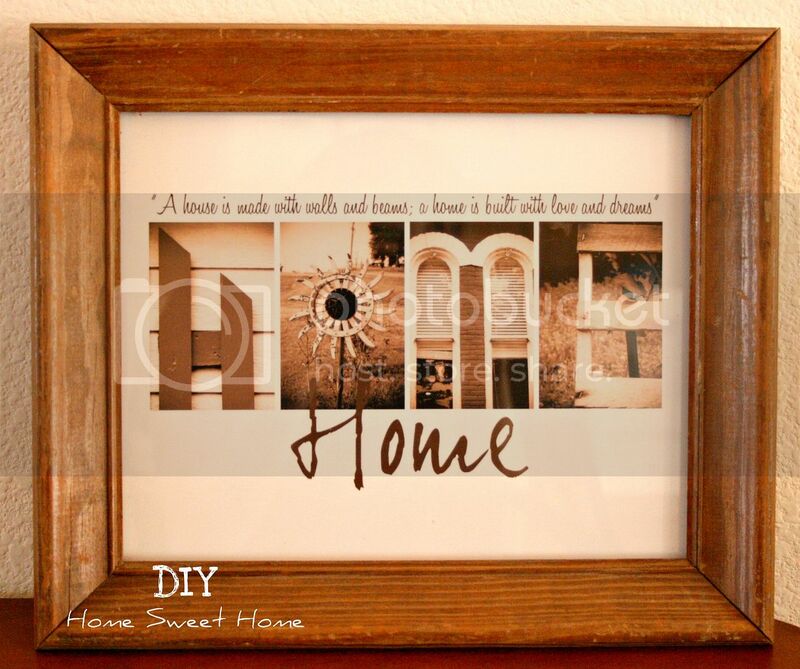 *Update: Life is Art Creations is giving a 10% discount to DIY Home Sweet Home readers till the end of January!!! Just mention 'DIY Home Sweet Home' when you e-mail your orders to get in on this amazing offer. Please enter my name I LOVE the Family one the best ! HI I also LIKED the facebook page for Life is Art Creations !! and left a comment that I came over from your blog here at DIY home sweet home ! So hard to choose! Family and probably my daughters name for her. Thanks for the give away. I liked you and commented on FB. I also commented on your facebook! I posted! Here are the url's! I really like the one you framed. I feel like that one or the FAMILY one would suit us best. We have so many pictures with other sayings on them already. :) Love the frame you chose! I like the love, faith &hope prints. Hard th choose just one. I commented on your facebook. I would pick the home Life is Art creation. I like the BELIEVE photo. I have posted about this giveaway on my wall. Thank you for the extra entry! I left a comment on your DIY Home Sweet Home FB page about entering this giveaway. These are so cool! I would love the "believe" print. That's my theme for the year. I posted on Facebook: well, I can't get the URL t work. My fb name is Kmberly Clements Tanner. I liked your Facebook page and I eft a comment there. I visited their website and I would get the Faith print! Love it! Thanks for sharing.